First step: Pick a shoulder and measure the distance from your waist, across your shoulder to the back of your hip. 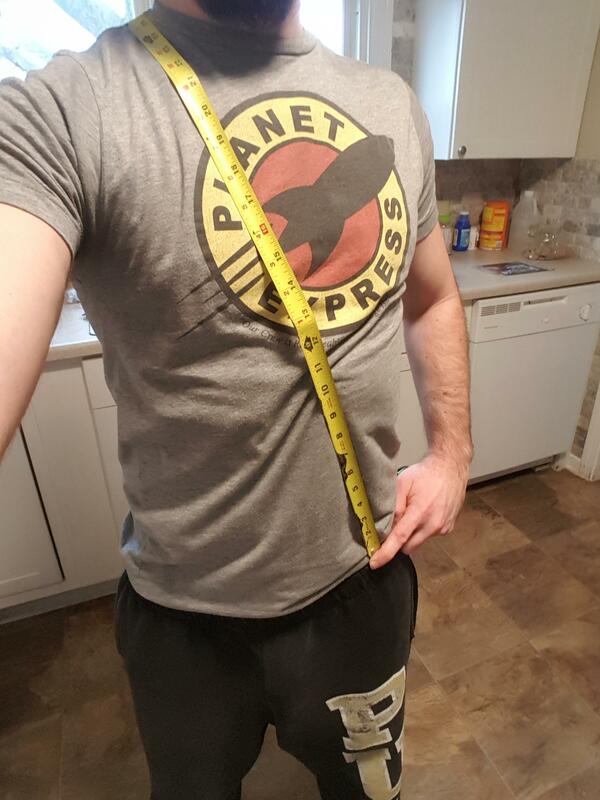 (can be done with a standard tape measure or one you would actually use for measuring cloth/body tapes). Edit!!!! It has been suggested that measuring this distance with your armor and standard belt rig is best for proper in kit measurements.,which I would agree with. 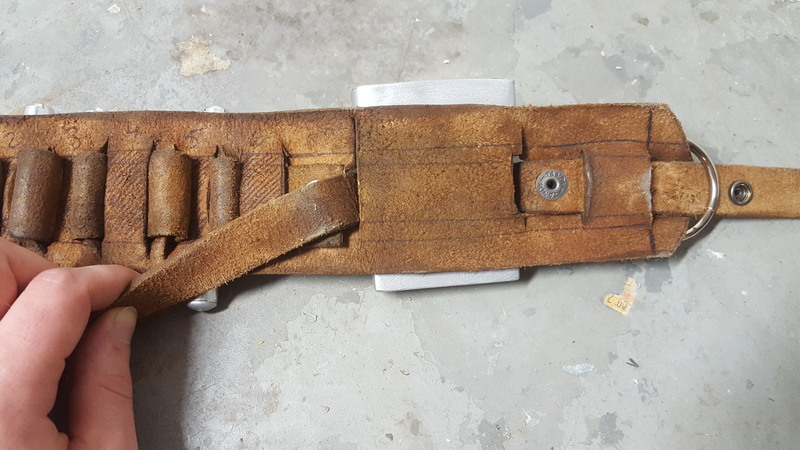 However, if your kit is not yet compete it is always best to add a few inches or so to your final measurement as you can always cut off excess leather but you cannot add leather if it happens to be too short. 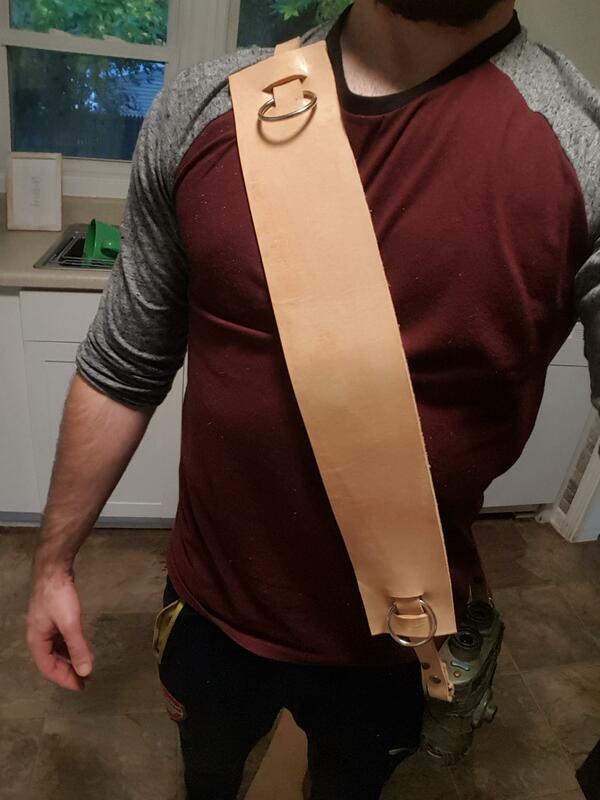 One you measure the distance from the front of your hip to the back of your hip going across the shoulder, use your leather cutting tool to evenly cut out the base strap (by that I mean the smaller skinny strap) for your bandoleer: If I remember correctly I chose to cut mine at a width of 1" but in my reference photo it is showing the width I used for the cartridge base holder. Once you have your under-strap cut get some paper and draw your template for the cartridge holder (here I just taped a few pieces of computer paper together). 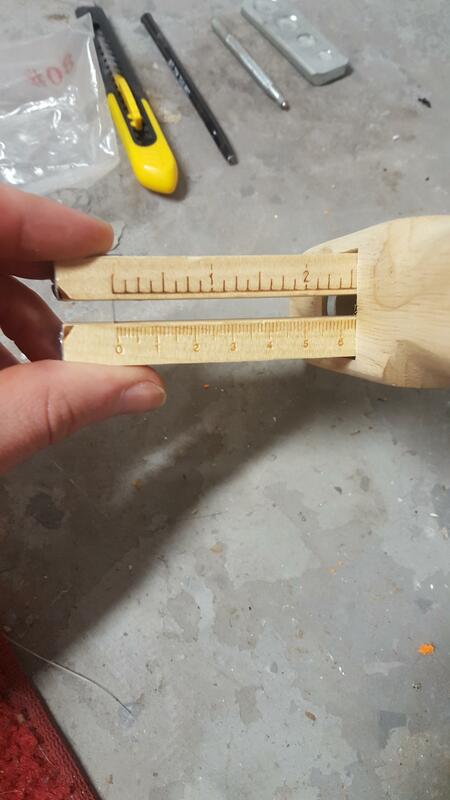 From there, measure the width of your template and cut slots in the middle of your paper template towards the ends and feed your 1" leather strap through them. This way you can get a feel for sizing. It is way easier and cheaper to do it with paper first than leather in case something doesn't look right or you made your original template too large or too small. I chose to just keep my template a simple long rectangle on the paper version that way I could fiddle with the design once I cut it out of leather but I knew at least the length and width I wanted. Once I was happy with the general length and size of my paper template, I clipped on my aluminum chalk holders to my paper template to figure out where I wanted to place them and marked the general location. 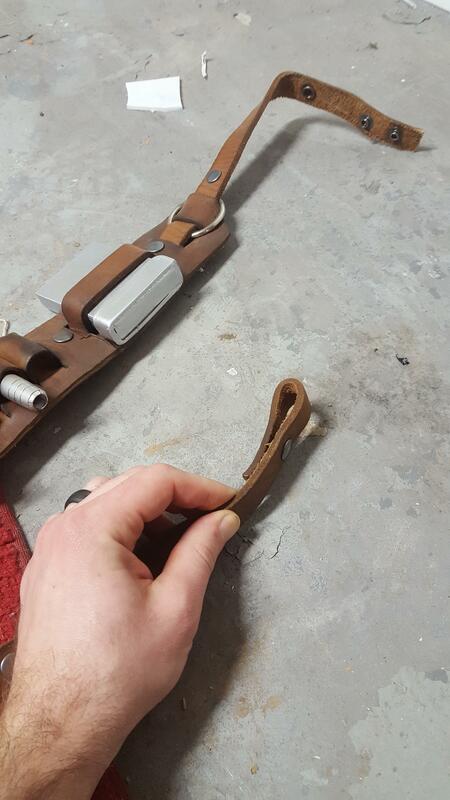 From there, use your leather tool to cut your cartridge holder base. Cut the slots in it just like you did with your paper template and feed your 1" strap through them. 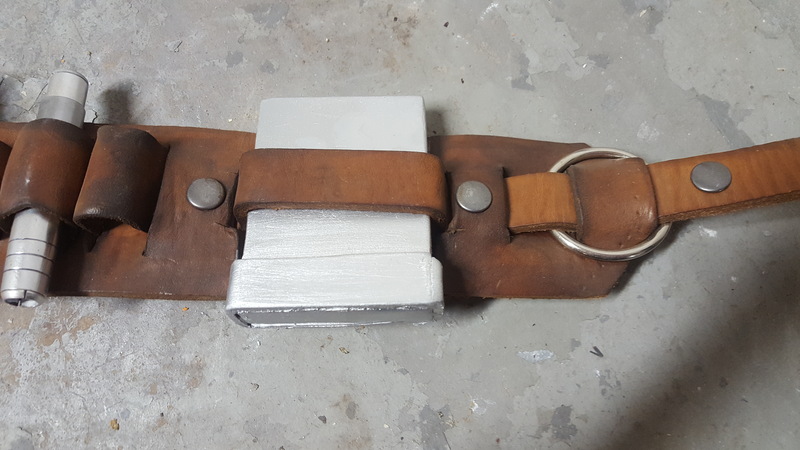 I also chose to feed the 1" strap through my two 'O' rings an either end to get a feel for the general look I was going for. 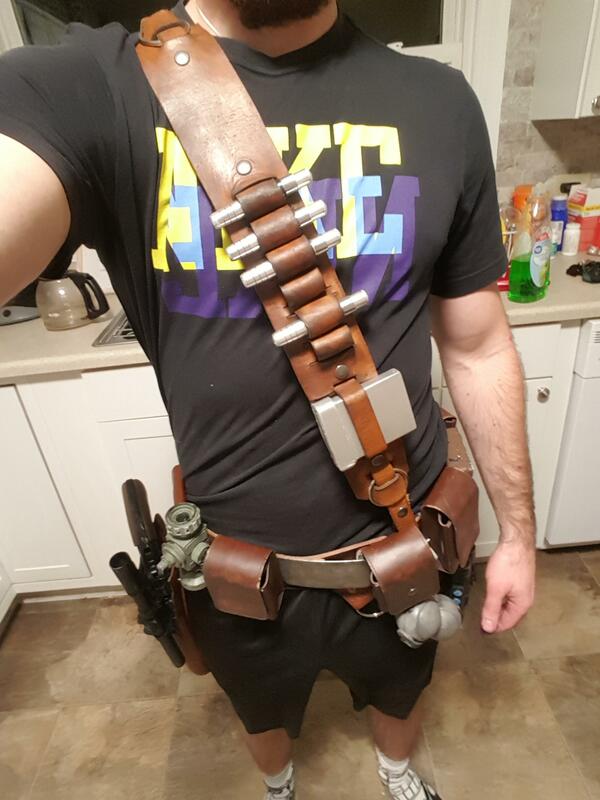 As you can see on the bottom of my bandoleer I also added snaps so that I can either choose to attach it to my belt or to my macrobinoculars depending on my mood. I did this by using 1 'female' snap and 2 'male' snaps to the ends of my 1" strap. Once you have all that figured out, it is time to measure out where to put your cartridges! Again I didn't take complete step by step pictures here to bear with me. 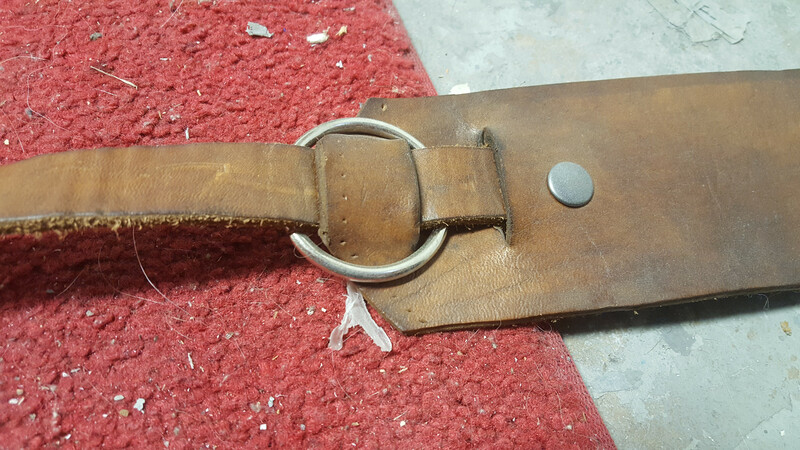 What I did was mark on the back of the leather the width I wanted to make the loop strap along the entire length of the leather. I then laid my paper template with the marks from the chalk holders next to the leather and remarked them there. 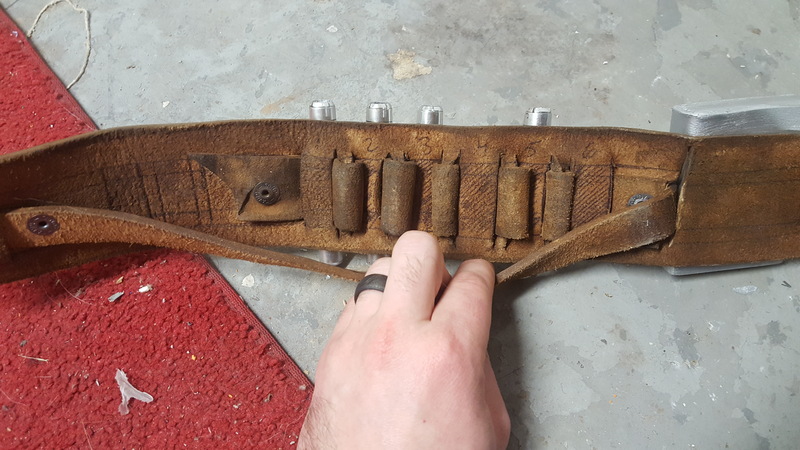 You will want to place the chalk holders (or whatever you will be using) on the leather and then trace the outer edges of each one while leaving a gap between them (this gap will be where the leather will loop). As you can hopefully see in the photo, I marked an 1" space numbered 1 through 6 where the chalk holders will go and have about a 1/4" gap between each one. Using your box cutter or exacto knife, cut, cut your leather on your marked lines. I also used the same method for the larger cartridge but instead of cutting a separate strap, I secured it in place with my 1" strap. I also looped this 1" strap so that it weaved in and out of the 'O' ring which secured it in place on either end. Guess what! 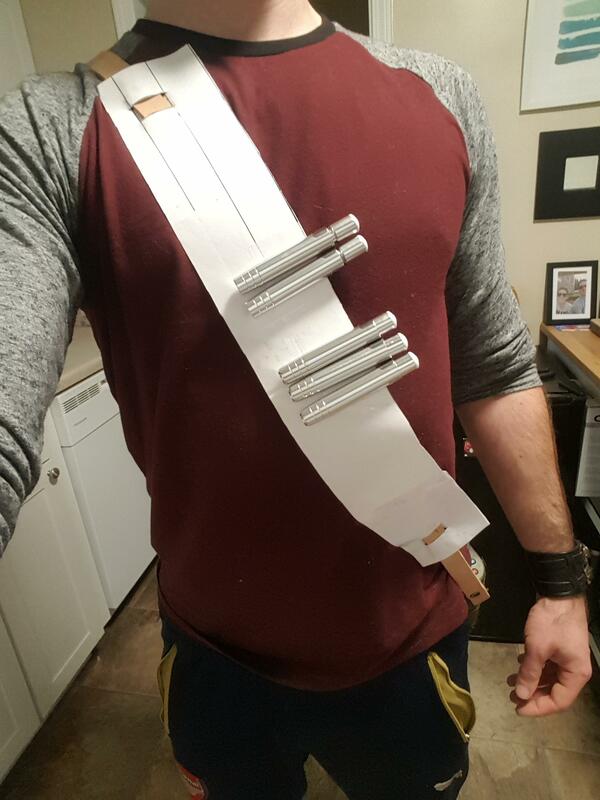 You have now completed your bandoleer! Stain that bad boy whatever color your heart desires and you are good to go! Good work vod! 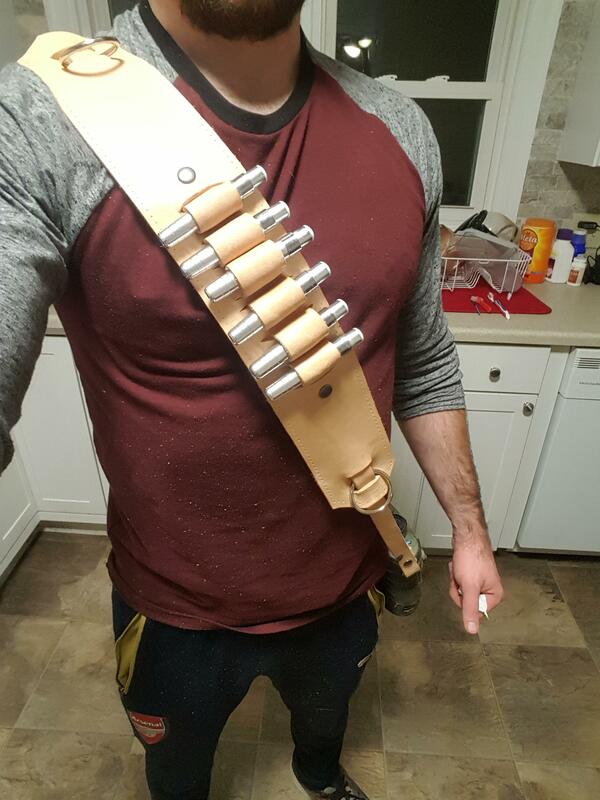 You now add your very own bandoleer to your kit. Wear it it with pride! Hopefully this tutorial is helpful and if any of these steps are confusing feel free to shoot me any questions and I will do my best to answer them! Amazing work there vod! 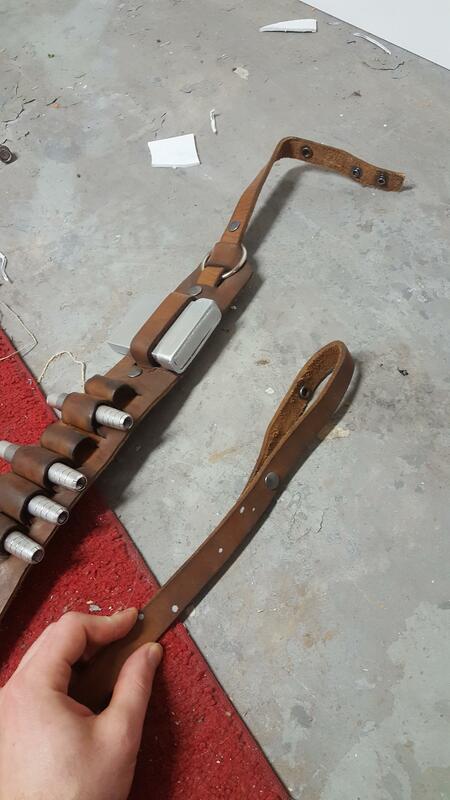 Thanks a lot for this, ive been trying to find a tutorial for bandoleers. Beautifull! Love the mix of the tubish kind of things and the box on the bando! If you're not already calling this The Mandoleer, you should be. Awesome work. Hahahahaha amazing and thanks you! If you measured it on your body, how close is it to fitting correctly with you full Kit on? 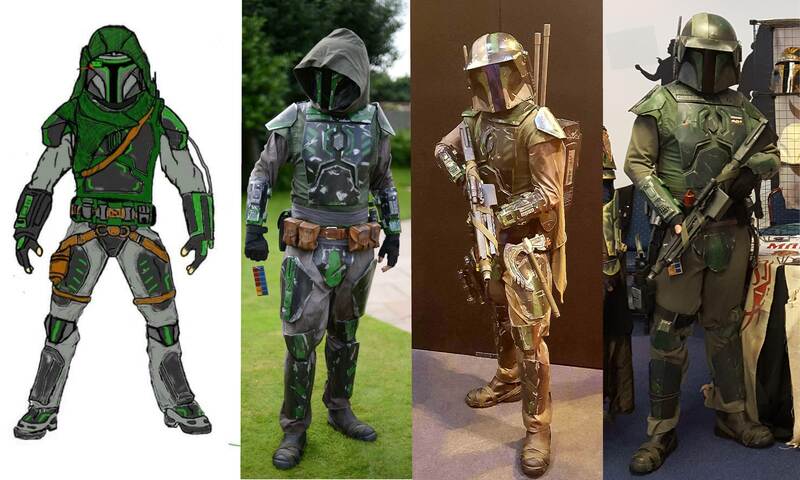 Wouldn't you need to add a couple of inches to account for chest/shoulder/back plates, flak vest, flight suit, as well as any waist items such as girth belts or holsters? I love it. I'm bookmarking it, and making it this weekends project. Thank you kindly and awesome!!! I am glad I could be of assistance. I will keep an eye out for your build!